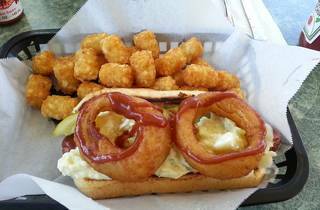 The Slaw Dogs is a small eatery hidden inside a Pasadena strip mall, a compact spot where diners choose from a slew of custom and build-your-own dogs. There's a small selection of hamburgers here, too, but the hot dogs are where it's at. 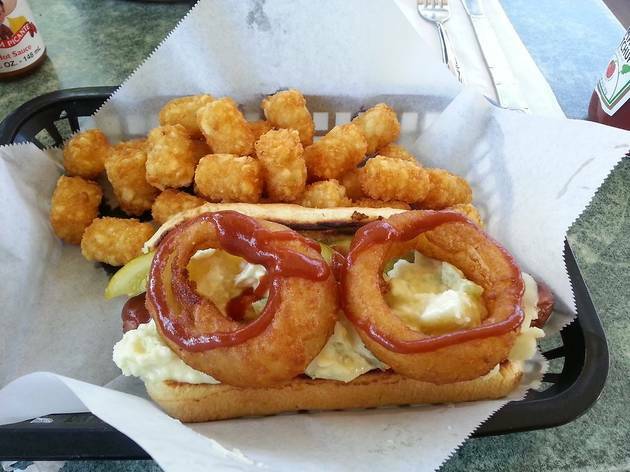 Our favorite pick goes to the Picnic Dog, a quarter pound of Vienna beef covered in potato salad, onion rings, BBQ sauce and a pickle spear. Take one bite and you've got an entire picnic in your mouth.